Florida International University law school dean Alexander Acosta will succeed Democratic Party boss Tom Perez as secretary of labor. The Senate voted 60-38 to confirm Acosta on Thursday evening, making him the last nominee to assume his post in the cabinet. Acosta received the support of 51 out of 52 Republicans and a handful of Democrats. Democratic Sens. Bill Nelson (Fla.), Joe Manchin (W.V. ), Jon Tester (Mont. ), Claire McCaskill (Mo. ), and Heidi Heitkamp (N.D.), who face tough reelection battles in states won by President Donald Trump, joined the Republican majority to confirm Acosta. Sens. Catherine Cortez Masto (D., Nev.), Bob Menendez (D., NJ), Mark Warner (D., Va.), and Angus King (I., Maine) also voted to confirm Acosta, the Trump administration's first Hispanic cabinet nominee. Republican Sen. Pat Toomey (Penn.) and Democratic Sen. Gary Peters (Mich.) did not vote. Thursday's vote was the fourth time Acosta has been confirmed to a federal post. He received unanimous support from the Senate in prior confirmations to serve as a member of the National Labor Relations Board, civil rights attorney at the Department of Justice, and as U.S. attorney in southern Florida. 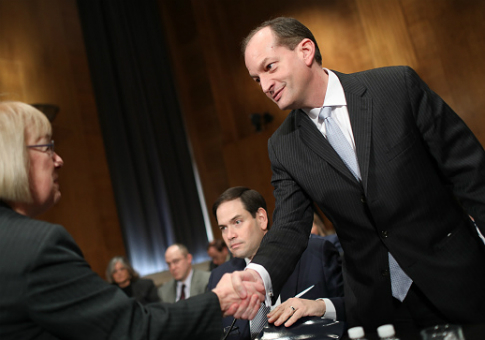 Acosta's path to the top post at the Department of Labor faced increased partisan opposition. He was advanced out of the Senate Committee on Health, Education, Labor & Pensions on a 12-11 party-line vote. Ranking Democrat Sen. Patty Murray (D., Wash.) opposed the "troubling" nomination in the committee and on the full Senate floor. President Trump has made rolling back regulations a priority in the first year of his administration, issuing an executive order that directed agencies to eliminate two rules for every new regulation adopted. That order is now subject to a legal challenge. Acosta is taking over a department that issued several controversial regulations under Perez, who now leads the Democratic National Committee. For example, a Texas judge blocked implementation of the overtime policy adopted by the Obama administration in November. It will fall to the agency's new leadership to decide whether to continue defending that rule. Conservative legal experts urged Acosta to act quickly to roll back other policies adopted by Perez. John Berlau, a senior fellow at the pro-free market Competitive Enterprise Institute, said Acosta should quickly roll back the Fiduciary Rule set to go into effect on June 9. The rule, adopted by the Labor Department in 2016, would allow regulators to oversee investment advisers working on retirement accounts. "The DOL clearly went beyond its authority from Congress by regulating the entire retirement system of 401(k)s and individual retirement accounts," Berlau said in a statement. "President Trump has already ordered a review of the fiduciary rule, but Secretary Acosta should make sure this review is thorough and complete before the rule takes effect, so middle class savers do not suffer unnecessarily." Acosta was the last cabinet secretary to be confirmed. Trump's initial choice for the Labor Department, fast food executive Andy Puzder, withdrew from consideration in February after months of fierce union opposition and the threat of multiple Republican defections. Acosta's confirmation will give Trump his first full cabinet since he was sworn into office on January 20.